“It’s a new dawn. It’s a new day. It’s a new life for me, and I’m feeling good.” No, Monica doesn’t make us endure another stab at what is a Nina Simone classic, but has since become a weight loss punchline for late night talk shows. Mercifully, she doesn’t try to out JHud, JHud and if she loses a pound, we’ll call Melissa Gold on her. However, the Atlanta songbird does cause one to head scratch at the project’s declarative title which seems to unintentionally mock the environs within. There is no irony here. The opening and closing intros are done with a seriousness that shouts a “new life” intention that never materializes. 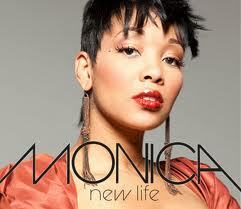 In fact, she repeatedly warns listeners “don’t look back;” then, nearly everything about New Life would have Monica turn into a pillar of salt. “It’s a new dawn. It’s a new day. It’s a new life for me, and I’m feeling good.” No, Monica doesn’t make us endure another stab at what is a Nina Simone classic, but has since become a weight loss punchline for late night talk shows. Mercifully, she doesn’t try to out JHud, JHud and if she loses a pound, we’ll call Melissa Gold on her. However, the Atlanta songbird does cause one to head scratch at the project’s declarative title which seems to unintentionally mock the environs within. There is no irony here. The opening and closing intros are done with a seriousness that shouts a “new life” intention that never materializes. In fact, she repeatedly warns listeners “don’t look back;” then, nearly everything about New Life would have Monica turn into a pillar of salt. With a new hubbie, resurging music career, and chatter about her potentially becoming the next peach holder for the Real Housewives of Atlanta as proof in the pudding, ma is certainly living today anew but she’s singing yesterday’s blues. Thank heavens she sounds good doing so. Never a stranger to perfect pitch, Monica blows throughout this set of sad-eyed ballads and formula uptempo hip hop soul collabos. Like her mentor, Whitney Houston, before her, Monica’s signature, melisma-rich vocals elevates material that would be pedestrian in lesser hands (“Breathe” and “In 3-D” we’re looking at you). Some even Monica’s able instrument cannot save (“Amazing,” you know that side-eyes is bulls-eyeing you from an angle). If acting is in Monica’s future, she demonstrates herself a consummate actress, conjuring up sincere heartache and longing on melancholy melody after melancholy melody, as on the yearning “Catch Me”—one would never know this is a deliriously happy bride still in her honeymoon phase. The first duet between Monica and Brandy since their 13 week run at #1 on the BillBoard Hot 100, “It All Belongs To Me,” isn’t the only kiss-off song laundry listing wrong deeds, with “Big Mistake,” “Time to Move On” and “Until Its Gone” join an depressingly long list of wrist-slitters. I mean, there’s a song entitled “Cry” for God’s sake, which is a retro-soul ditty about crying while in a loving relationship, but jeez Louise! At least producer Salaam Remi made the mundane sound fresh by electrifying the ol’ school melody of Jazmine Sullivan’s lyrical “Cry.” One only hopes that this unburdening catharsis was recorded before Monica met the new love of her life, lest we worry for the future of Mr. and Ms. Shannon Brown. We prefer to believe the infectiously uplifting soul pop of “Take A Chance” (feat. Wale) better reflects the state of this new Basketball Wife. Gifted by producer Rico Love, “Take a Chance” soars above its synth pop conventions thanks to a sticking melody and Monica daring to play in the higher end of her husky register. Love’s slick production on “Daddy’s Good Girl” is less able to escape the clichéd traps of dark electro anthems better suited for Rihanna. Love’s “Man Who Has Everything” fares better as a quasi-woman’s empowerment anthem, if empowerment is letting a Sugar Daddy know he won’t have to pay for anything; ma’s got this. The spendthrift baller has just gotta give up his heart to the Sugar Mama. Uhm, yeah…did I mention how great Monica sings throughout? Successful old-soul-meets-hip-hop-soul formulas from Monica’s comeback project, Still Standing, abound once again on New Life (I promise you the title is not meant tongue-in-cheek). Courtesy of producers Lamb and Missy Elliott, on the lead single “Anything (To Find You)” (feat. Rick Ross), Monica finds herself riding interpolating samples of the MJB and Method Man version of the Marvin & Tammi classic “You’re All I Need To Get By” with a mix of Biggie’s “Who Shot You” thrown in for good measure. Producer Missy Elliott plays the remembrance of things past wizardry again by raising Phyllis Hyman’s “I Don’t Want To Lose You” from the soul hit graveyard for the second single, “Until It’s Gone.” Pop & Oak’s wistful “Catch Me” also rolls over familiar chords that any ‘70s soul fan will know instantly. The tried and true formula is calculated to a fault, but in each instance it serves to make Monica as timeless and current as intended, bridging the gap between old and young audiences. Overall, the approach works, with the starling losing little ground from the phenomenal set-up of her near perfect Still Standing comeback. Now, if we can just get her to name things what they are and sing just a teensy bit more about the joy inside, she might yet beat her best outings to-date. Recommended.